Whether you’re a teenager or a full-grown adult, you deserve to have straighter teeth. Traditional braces have been around for many years, but they aren’t necessarily for everyone. Thanks to advancements in dental technology, you can get a straighter, healthier smile without the long and difficult process that comes with metal braces. After hearing the benefits from your orthodontist in Parsippany, you just might be excited to visit them sooner than later! 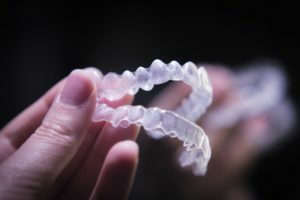 If you’re facing mild or moderate issues in your mouth, clear aligners from Invisalign can make the necessary adjustments without excessive hardware. This is ideal if you are sensitive to metal or don’t just need it. The treatment process is already very simple and straightforward. After completing your Smile Assessment, your orthodontist in Parsippany will create a series of clear aligners with the first set sharing the closest resemblance to your current teeth. Depending on what your orthodontist recommends, you’ll swap out your current set for the next one in the series every few weeks or so. On average, treatment takes around 12 months, much shorter than average treatment time for traditional braces. It’s important that you wear your aligners for 20 to 22 hours per day to achieve results, but that doesn’t mean you can’t remove them at all. Unlike braces in Parsippany, clear aligners are meant to be removed for regular brushing and eating. This means you don’t have to change you brushing routine or stop eating the foods you love during treatment. If you have a special occasion that involves taking photos, you’ll also be able to remove them for that. However, you may not need to, considering how unnoticeable they are. It’s in the name! Invisalign clear aligners are transparent and meant to be invisible to your friends, family, and coworkers around you. If you’re a teenager who doesn’t want to have braces at a young age or an adult who wants to maintain a professional image, Invisalign is the clear choice for fixing crooked or crowded teeth. During your Invisalign treatment, you’ll want to visit your dentist every 4 to 6 weeks so they can make sure you’re progressing properly. Metal braces on the other hand typically require more appointments so your orthodontist can make adjustments to the metal hardware and wiring in your mouth. More visits only mean higher costs to you. Invisalign doesn’t require as many visits, just switching to the next set in your series of aligners at the right time and committing to wearing them as long as possible. Don’t let crowded and crooked affect your look or dental health. Schedule a consultation with your orthodontist in Parsippany today to complete your smile assessment! Dr. Alan Rauchberg earned his undergraduate education from the University of Michigan at Ann Arbor and the University of Maryland at College Park. He earned his DMD from Temple University and completed his general residency at MCH Hospital in Philadelphia. To learn more about his Invisalign treatments and practice, contact him at (973) 718-9887.